A connoisseur’s game – For the fainthearted . . .
Last night’s attendance was announced over the ground’s public address system, 2,330 including 120 supporters of Grimsby Town. 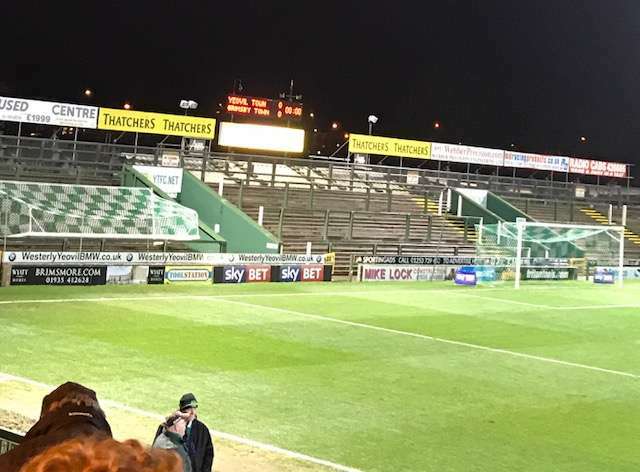 It was barely more than a quarter of the crowd of 9,196 that attended last Friday’s FA Cup fourth round clash with Manchester United; there had been 2,176 away supporters at that match, so around 5,000 more Yeovil Town fans. Being honest, the FA Cup tie was a first visit to Huish Park in fifteen years; going to the fixture against Grimsby four days later was an opportunity to experience real football, football away from the gross greed and commercialism that characterize the top clubs – it is said that Alexis Sanchez of Manchester United earns more in a month than the Yeovil Town budget for the year. The most notable things about the match seemed to be that Grimsby Town had two players sent off, the second dismissal making the remainder of the game very one-sided; that Yeovil scored three goals without conceding one, an uncommon result for them this season; and that there was a bizarre pitch invasion by four people, who ran the length of the pitch before reaching the empty away terrace and were surrounded by stewards as they attempted to escape from the ground. Why would anyone attend a midweek game between two teams in the lower half of League 2? (Before English football engaged in the soccer equivalent of grade inflation, this was Division 4, a much more meaningful description of the level). Why go? Because this is real football. This is football played whole-heartedly for modest rewards. This is football played sometimes with more ambition than skill by players who will never enjoy the excessive riches of their star counterparts, but who bring delight to the faithful hundreds in the stands. This is football played in a community where there is a strong sense of place and a strong awareness of the long history of the club as the perennial underdogs. Watching a man returning from the half-time break with a cardboard cup of Bovril, there was a sense of tangibility. There was a sense that this was not the ersatz game played on television screens and watched by fans in replica shirts standing in pubs, but was something authentic, something that filled every sense. 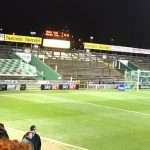 Local West Country accents called encouragement as the teams returned to the pitch and one knew it could only be Yeovil. The next midweek fixture is against Fleetwood Town in the quarter-final of the Checkatrade Trophy: real connoisseurs’ football. A really enjoyable read. I had never thought of how divided the divisions are. The Yeovil team are enjoyable entertainment for many local fans. It’s nice to think they are so loyal, I know one in particular though always think she is crazy! I hope that when big team play at the same time people do not desert the stadium as it usually happens here when premier league is played at the same hours, the local league tournament is postponed or canceled because every fan has a big team to watch in England and this choice comes first.